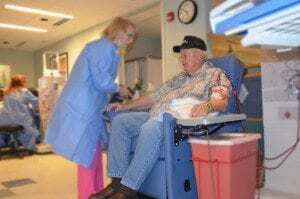 Last month, Ozarks Dialysis Services (ODS) upgraded patient chairs with help from CoxHealth Foundation. Patients coming to ODS, sometimes on a daily basis, have no choice of where they sit to complete their dialysis visit. Bruce Upton, Administrative Director at ODS, says that these chairs are “in use for fifteen to sixteen hours per day, six days per week.” After 7 years of use, these chairs breakdown and patients will sit for hours on chairs with degraded padding as a result of constant use. Bruce approached the Foundation about a grant for his department to help replace all the chairs. He was concerned that the gradual replacement of these chairs over the course of multiple budget cycles would lead to patients jockeying for the newer chairs and creating unnecessary patient dissatisfaction. As with all department grant decisions, the Board of Directors for the Foundation reviewed the written request at the February meeting and granted $57,910 to replace 26 chairs. When the chairs arrived, the patients were “thrilled.” The new chairs have capabilities that make it much easier and safer for staff to carry out their duties (see picture above). Patients are more at ease while they spend their time waiting and are able to self-manage their comfort with the chair amenities for reclining and heat. Heat becomes important because as blood is returned, the body must normalize the temperature causing the patient to feel cold. This has made the heat a popular upgrade for patients. All this made possible by the generous donations made by employees and the community.